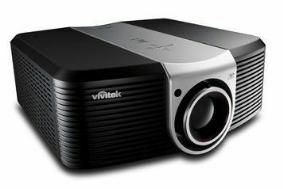 CEDIA UK EXPO 2009: Vivitek unveils world's first LED, Full HD, DLP projector | What Hi-Fi? With Full HD resolution, high throughput LED optics, 800 ANSI Lumens and low power consumption, Vivitek says the H9080FD is capable of delivering "brightness and high-definition imaging unmatched by any other LED unit". The life of the LED unit is estimated at 20,000 hours of normal operation – said to be ten times the lifespan of a normal lamp – so users won't have to worry about lamp replacement as on a conventional projector. The LED illumination system replaces the lamp, colour wheel and shutter of normal projectors. What's more, the light engine is completely sealed to prevent dust getting in or light leaking out. It's fitted with Texas Instruments' Dynamic Iris and Brilliant Colour technology, and has a claimed contrast ratio of 100,000:1. Dynamic Iris automatically adjusts the black levels of video content to produce deeper blacks particularly during dark scenes. Also part of the spec is Gennum's latest 9450 video processor, which allows the user to manually change the projected frame rate. It also scales and de-interlaces standard- and high-definition sources. Connectivity includes two HDMI 1.3 inputs, plus an RS-232 input for remote triggers and firmware updates via a PC. A backlit remote commes as standard. The Vivitek H9080HD costs £10,995 and is available in the UK now through distributor Rapesco AV. It's the flagship model in a range that will eventually run to 23 models for the UK market, ranging in price from £400 to £11,000.